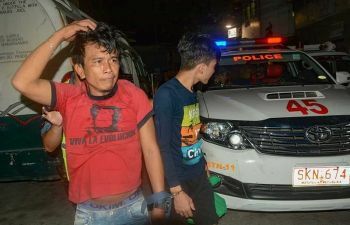 SURIGAO CITY (Updated) – The death toll from the ferry that sank off Leyte on Saturday evening reached eight after the Philippine Navy recovered five more bodies on Monday. The roll-on-roll-off vessel M/V Maharlika II began to list in choppy water and strong winds off San Ricardo in Southern Leyte last Saturday. The recovery of the five bodies - apparently those of two adult females, two males and a child – came amid continued search and rescue operations in the vicinity of Surigao Strait for the missing passengers of the ill-fated ferry. A total of 113 survivors were rescued while at least three others remained missing, said Captain Joseph Coyme, Deputy District Commander of the Philippine Coast Guard in Northern Mindanao. Coyme said more persons could be missing since many people have come asking for the whereabouts of their relatives or family members since Sunday. Marites Mollanda of Parang, Cantilan, Surigao del Sur arrived at Lipata Port Sunday to ask about her missing sister-in-law, Arleta Puyales. Puyales took the ferry along with her other sister-in-law, Tita Mesias who survived the ordeal. Mollanda said Puyales was still missing and her name was not on the list of missing persons at the Command Center at the port. Jessie Saberon, a 57-year old survivor from San Pedro, Laguna, said her husband, Felizardo, and granddaughter, Tepani, were both missing. Their names were also not on the list of missing passengers. Some other survivors and relatives were waiting for word about their relatives in Lipata port. 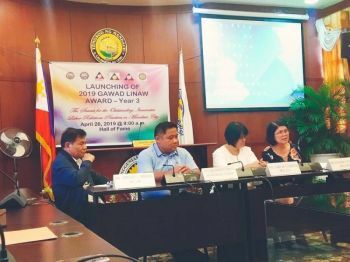 Coyme said they were still validating the claims of the relatives since it was apparent that some of the passengers were not listed on the manifest of M/V Maharlika II. He said the vessel only listed 58 passengers and 22 crew members or a total of 84 people. He quoted Maharlika II skipper Juan Cuyago as saying they counted 116 people on board before giving the order to abandon ship. Captain Kieser Gatdula of the Philippine Air Force said they already made four rounds of aerial survey on board a chopper but could not see any sign of life. “We been hovering the area that’s 25 nautical miles but we have just seen scattered life jackets,” he said Monday. Boats from the Philippine Navy were also searching the area on Monday. Maharlika II sank around 6 p.m. Saturday off Pintuyan, Southern Leyte after losing control while heading for Liloan, Southern Leyte. 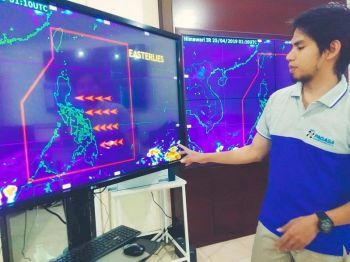 Johanne Jake Miranda, a diver in Surigao City, said more could have died in the treacherous waters of Surigao Strait had they not contacted foreign vessels nearby. He and Coast Guard officials went to his own dive shop at Barangay Punta Bilar because his shop has better radio signal. “We contacted the three foreign vessels and these foreign vessels have rescued a total of 73 individuals. Fifty-four people were rescued by M/V St. Martin, 18 by M/V Lara Venture and one by Ocean King,” he said. He said the water of Surigao Strait has a constant current of two knots per hour. During the incident the water was rough because of strong winds. Survivor John Paul Maulliet, 18, from Lianga, Surigao del Sur, said he couldn't thank enough St. Martin for saving them. The Philippine Coast Guard (PCG) has dismissed the allegations of over loading as another cause of the sinking. Commander Armando Balilo, Coast Guard Public Affairs chief, said the ship isn’t overloaded since the maximum searing capacity of the vessel is at 403 passengers. He said those survivors that were not listed in the passenger manifest where either bus or truck drivers, as well as last minute chance passengers who failed to list their names upon purchase of their tickets. Noel Torralba, Coast Guard sub-station commander in Lipata Port, also affirmed that the vessel was not overloaded. Otherwise they would not have allowed it to leave, he added. Juanito Villano, operations manager of Montenegro Shipping that has two ships plying the Surigao-San Ricardo, Southern Leyte route, said they canceled voyages on Saturday due to the weather condition. M/V Filipinas Dapitan of Cokaliong Shipping Lines left for Cebu on Saturday but returned to the port of Surigao after one hour at sea. Al Caturla, Port Police Commander of Philippine Ports Authority, said the ship has finally rested. It is considered as the oldest ship plying the Surigao City-Liloan, Southern Leyte route, which it had served for 30 years. “It carried 13 rolling cargoes. It departed at 11:30 in the morning on September 13,” he said. Caturla had been assisting some survivors at the port area in Lipata. Some generous individuals in Surigao City provided food for the survivors and emergency responders. PhilHarbor, the company that owned Marharlika II, has offered P3,000 as cash assistance to each survivor. It also provided food to all survivors. But some survivors said they did not receive the amount as their names were not on the manifest.